The Demotic script was referred to by the Egyptians as sš n šꜥ.t "document writing", which the second-century scholar Clement of Alexandria called ἐπιστολογραφική "letter-writing", while early Western scholars, notably Thomas Young, formerly referred to it as "Enchorial Egyptian". The script was used for more than a thousand years, and during that time a number of developmental stages occurred. It is written and read from right to left, while earlier hieroglyphs could be written from top to bottom, left to right, or right to left. Parts of the demotic Greek Magical Papyri were written with a cypher script. Early Demotic (often referred to by the German term Frühdemotisch) developed in Lower Egypt during the later part of the Twenty-fifth Dynasty, particularly found on steles from the Serapeum at Saqqara. It is generally dated between 650 and 400 BCE, as most texts written in Early Demotic are dated to the Twenty-sixth Dynasty and the subsequent rule as a satrapy of the Achaemenid Empire, which was known as the Twenty-seventh Dynasty. After the reunification of Egypt under Psamtik I, Demotic replaced Abnormal Hieratic in Upper Egypt, particularly during the reign of Amasis II, when it became the official administrative and legal script. During this period, Demotic was used only for administrative, legal, and commercial texts, while hieroglyphs and hieratic were reserved for religious texts and literature. Middle Demotic (c. 400–30 BC) is the stage of writing used during the Ptolemaic Kingdom. From the 4th century BC onwards, Demotic held a higher status, as may be seen from its increasing use for literary and religious texts. By the end of the 3rd century BC, Koine Greek was more important, as it was the administrative language of the country; Demotic contracts lost most of their legal force unless there was a note in Greek of being registered with the authorities. Ostracon with Demotic inscription. Ptolemaic Kingdom, c. 305–30 BC. Probably from Thebes. It is a prayer to the god Amun to heal a man's blindness. Contract in Demotic writing, with signature of a witness on the verso. Papyrus, Ptolemaic era. From the beginning of Roman rule of Egypt, Demotic was progressively less used in public life. There are, however, a number of literary texts written in Late Demotic (c. 30 BCE–452 CE), especially from the 1st and 2nd centuries AD, though the quantity of all Demotic texts decreased rapidly towards the end of the second century. In contrast to the way Latin eliminated minority languages in the western part of the Empire and the expansion of Koine Greek led to the extinction of Egyptian, it did not replace Demotic entirely. After that, Demotic was only used for a few ostraca, subscriptions to Greek texts, mummy labels, and graffiti. The last dated example of the Demotic script is dated to December 11, 452 and consists of a graffito on the walls of the temple of Isis at Philae. Demotic is a development of the Late Egyptian language and shares much with the later Coptic phase of the Egyptian language. In the earlier stages of Demotic, such as those texts written in the Early Demotic script, it probably represented the spoken idiom of the time. But, as it was increasingly used for only literary and religious purposes, the written language diverged more and more from the spoken form, leading to significant diglossia between the Late Demotic texts and the spoken language of the time, similar to the use of classical Middle Egyptian during the Ptolemaic Period. 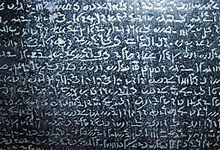 The Rosetta Stone was discovered in 1799. It is inscribed with three scripts: the Greek alphabet, Demotic, and Egyptian hieroglyphs. There are 32 lines of Demotic, which is the middle of the three scripts on the stone. The Demotic was deciphered before the hieroglyphs, starting with the efforts of Antoine Isaac Silvestre de Sacy. Scholars were eventually able to translate the hieroglyphs by comparing the Greek words, which could be readily translated, and the hieroglyphs, in addition to their existing knowledge of Coptic. Egyptologists, linguists and papyrologists who specialize in the study of the Demotic stage of Egyptian script are known as Demotists. The table below shows some derivative similarities from hieroglyphs to Demotic to the currently surviving Coptic alphabet. ^ Hans Dieter Betz (1992). The Greek Magical Papyri in Translation, Including the Demotic Spells, Volume 1. Betrò, Maria Carmela (1996). Hieroglyphics: The Writings of Ancient Egypt. New York; Milan: Abbeville Press (English); Arnoldo Mondadori (Italian). pp. 34–239. ISBN 978-0-7892-0232-1. Johnson, Janet H. (1986). Thus Wrote 'Onchsheshonqy: An Introductory Grammar of Demotic. Studies in Ancient Oriental Civilization, No. 45. Chicago: The Oriental Institute. Wikimedia Commons has media related to Demotic.